Cloth nappies come in various types on this page we go through the types of cloth nappies from fabrics and how they work. 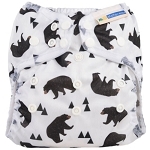 Pocket nappies are basically a waterproof outer with either a suedecloth or fleece liner attached to the cover to keep baby dry, there is a slot in the fabric usually in the back in which a absorbant pad is placed into the pocket. They are very adaptable as more stuffing (inserts) can be added for a heavy wetter, long journey or for overnight, or removed to make the nappy more trim for daytime, when adding more inserts make sure that the nappy still fits well in the leg openings. 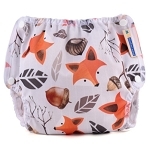 Popular nappy inserts are made from microfibre, hemp and bamboo or a combination my favourate was a microfibre insert with either a bamboo or hemp insert or booster underneath. 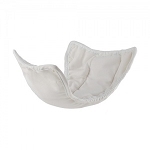 The inserts usually removed from the pocket when putting them in your bucket or wetbag ready for washing, in some nappies like the thirsties pocket nappy have a pocket opening at the front and back allowing inserts to come out during washing. Some have a pocket in them to allow them to be boosted easily. Some all in ones do come apart for easy washing and quicker drying such as Itti Bittis. These are the traditional nappy the type that my mum used on me!